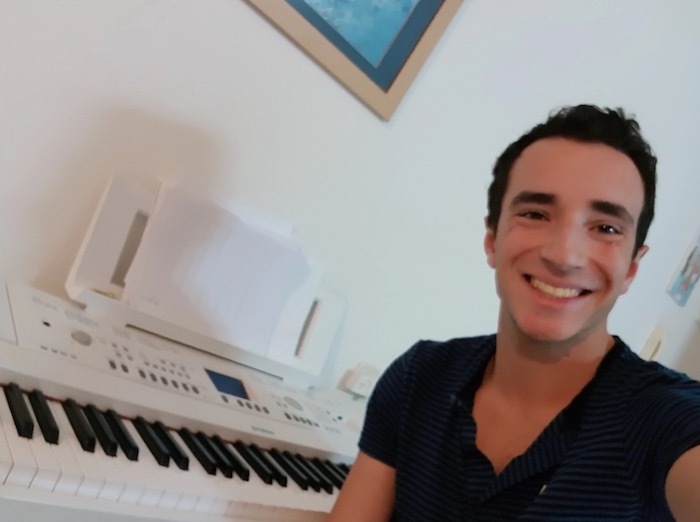 Today I speak with Noam Haddad (aka Pianoam on Fiverr.com), a 21-year-old piano player from Tel Aviv, Israel who has, for a long time, been covering his favorite songs on the piano, where he now makes a nice side income by doing his favorite hobby. I was interested to pick Noam’s brain about his techniques around covering songs on the piano, which he clearly has a talent. What’s the method to his madness? Is it easy? Can anyone do it? I set out to ask him these questions and learn more about his creative process. Hi Noam, how long have you been playing piano? Hey Dave! I’ve been playing piano for 11 years. I started playing when I was 10 years old. You’ve been very focused on doing a lot of cover songs on the piano, is this true? Yes. When I started play piano, I was learning with a teacher, who taught me mostly classical pieces. Some years later, after I developed and became more experienced, I discovered the world of piano covers. And since then, most of my time with the piano is being dedicated for that. Here’s an example of a song I did called “Mom” (in English), which is a cover of a parody song by Entertainment Channel. What do you like about playing covers vs. playing original tunes? So, one of the reasons I started making my own covers, was the simple fact that there is no sheet music for every song I want to play. I heard a song I really wanted to play, and I couldn’t play it, because I didn’t find sheet music for it. After I progressed and learned more, I found out how great it is to give your own touch and style to the song you like. The satisfaction is seeing up the final product, which is a mix between the original song and the way your interpretation to it. Do you remember some of the first songs you covered and why you covered them? When I was 15 years old, I was really into rock and metal music. My favorite band was “Avenged Sevenfold”, and one of the first songs I covered was “So far away”, one of their most famous songs. I listened to this song a lot, and also looked for different covers for this song in youtube- by different singers, all played by guitar and other instruments. One time I just decided to try and do it by my own, and I figured it- chord by chord. In addition, I really liked some of Adele’s songs, and still, “All I ask” is one of my favorite songs to cover. So you’re covering these songs by ear? Can you explain how you go about learning a song using just your ear and no sheet music or tablature? Yes, I cover these songs by ear. So how do I do that? First, we need to understand that the one of the most important thing in songs, and especially in piano covers, is chords. Chords are the driving force of the song, the thing that leads the song in a specific direction. There are different chords and different keys, and it’s really important to know most of the chords, in one key at least. So as I said, chords are important, and the first thing I recommend in creating piano covers is finding the right chords. How do we do that? 1- If you don’t want to find it by yourself, there are some sites in internet which provides chords to famous songs. 2 – If you want to find it by yourself, or you don’t find the chords in internet, do it by yourself. I won’t explain it here, because it’s a very long topic. But as a general recommendation, I would recommend finding the notes- in right hand- of the singer’s voice, and sometimes try to attach different chords to the right places, until you find the right chords. It’s a long road at the beginning, but you become better and better. So you record the melody first then, or at least find the melody first, before finding the chords? I don’t record the melody separately. It means that I play the whole song at the same time. About the question which thing I find first, the melody or the chords- it depends. Sometimes the chords are easier for me to find, sometimes the melody. But most of the time, it’s the mix of the two. For instance, I can find how to play a specific part of the melody, and after that find the chords for this part. And in the next part of the song, I first find the chords, and only then find the melody related to those chords. Aha. It sounds like you are covering all sorts of songs across many genres, both for professional and personal reasons. How long would you say the average cover takes you to a) figure out how to play it, and then b) record it? So when I started playing covers of my own, each song took me days to cover – finding the melody, the chords, and how to play it right, was really hard and has been a new experience to me. Now, after years of songs covering, I can learn how to play most of the songs completely after a few hours. Recording it isn’t really a problem, and it takes me less than a hour. In the record, though, it’s not so easy because you have to play it perfectly and not making any errors. You do it all in one take? ie. one performance beginning to end? How many attempts do you usually need to make? I almost always play it in one take, except for rare occasions where the song is really long, and I think a pause between the song parts will be better for my cover playing. It takes me between 1-5 attempts normally. What software are you using to record? Actually, most of the time I’m not using any software at all. My electric piano supports usb port, which allows me to connect the hard disk to it and record songs straight to the hard disk. If, sometimes, I need to edit my piano track, I use “Audacity”. So you’re saying you just use one track usually? Your recordings aren’t multi-tracked? So what tips would you suggest for people looking to get into the piano cover business like yourself? *Don’t give up on classical pieces. Classical pieces are often beautiful to play, and also very educational for your music knowledge. In a way, playing classical pieces made me better at playing covers for regular songs. *Try to find the chords by your own- at least at the beginning of your way- and not looking for it in interent. This music ability that you will require with this work will worth you a lot when you’ll progress. Look for chords pattern that you’ve already hear. You’ll see every day your progress. *In the beginning, don’t look for the hardest songs, with a lot of chords and key changes. Cover songs that you like, make a lot of effort in them. Play the backing track with different melodies and learn how to make the same song to sound better each time. Would you say weighted keys are a must for learning to play and covering songs? Or will any $5 keyboard do? Well, I started learning with basic, simple electric piano. For learning the basics of music, you don’t need nothing beyond that. 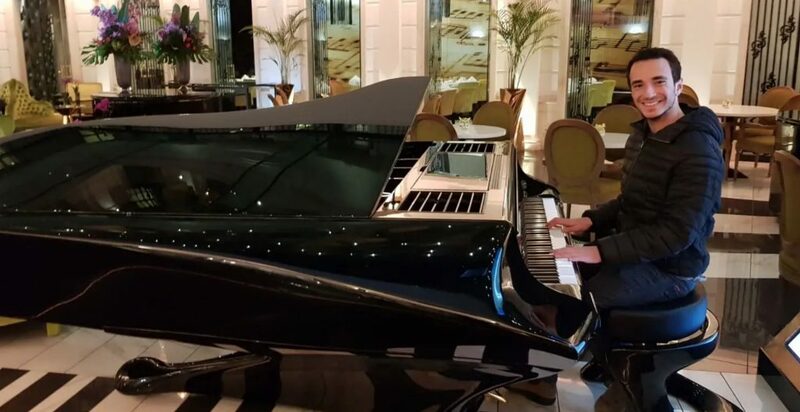 Of course, if you’re already have a real piano it’s best to play at it. After you learn and progress, you will understand by your own that you need to get a better piano. A better piano makes a better sound and provides all-around better experience. But for learning to play and cover songs? A simple electric piano is enough. Although, keep in mind that a 5$ keyboard probably won’t be enough. 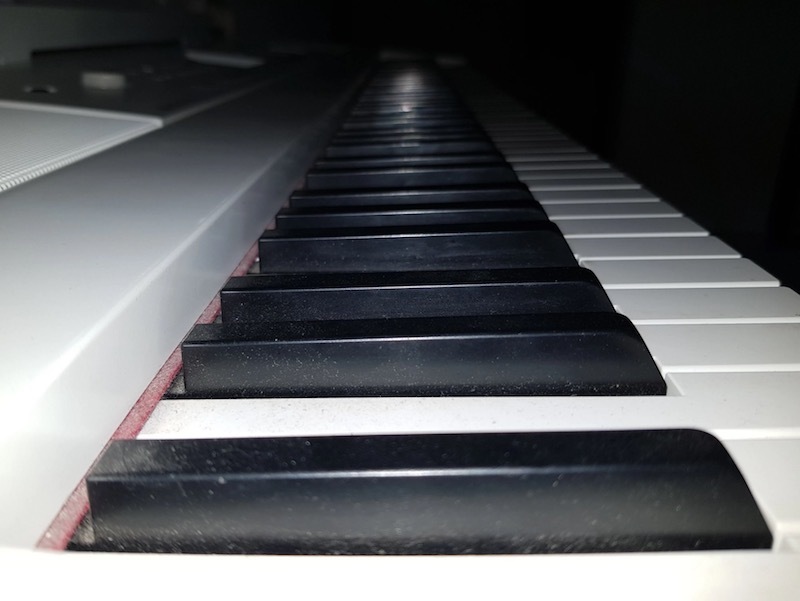 One of the single things I recommend to new players is buy a keyboard which supplies the “touch” utility, which means that with strong touch on the key you will get a strong, high sound, and with weak tough you will get a low sound. This is very important. I guess this is similar to weighted keys, but not exactly the same. I guess the next question is, can you make a living off of doing this kind of work. I’m sure people who would want to enter this line of work are wondering that. So Dave, this is a great question- and I’m actually asking this question for myself right now. In the last year covering songs was a hobby for me, hobby that finally is paying off. Still, I am far away from making a living off it. Although, I am sure that every person that actually wants to to dedicate a lot for it, will be able to progress a lot and, maybe, make a living off it. Anything else you might like to share with aspiring piano and keyboard players entering this field? Yes. the simplest, yet one of the hardest to implement advice to you, is not to give up. You listen to amazing piano covers in Youtube, made by talented pianists which years of experience behind them, and you want to be like them. So you start playing, and even after 2 days of playing, your piano cover sounds very basic- not similar to the cover you heard in Youtube. In this point most of the pianists give up, and comes back to their roots- playing from sheet music. And good luck to you all! Visit Noam’s youtube channel here!